If you are looking for a flavorful and healthy meal, you’ve found the perfect one: Chicken Tacos with Charred Tomatoes. With less than 300 calories and only 9 grams of fat, you’re on the fast-track for either losing weight or staying fit! I found this recipe while browsing though Eating Well. I love their website. 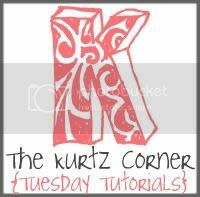 I can find healthy meals relating to just chicken, pasta, beef, desserts, and more. I can also find meals for two, meals in under 30 minutes, or meals on a budget. Tacos are one of Matt and my favorite dinner items. We love the spicy, Mexican-flavored spices, and I am a huge fan of Central Market’s flour tortillas and in-house, fresh pico de gallo. 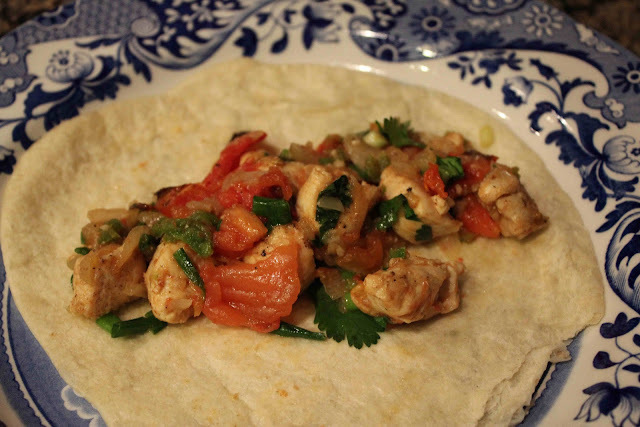 Centered on this “taco/spicy” flavored-theme, I found Eating Well’s recipe for Chicken Tacos with Charred Tomatoes. I love how fresh and organic this dish is! Nothing is “bottled” or in a package. 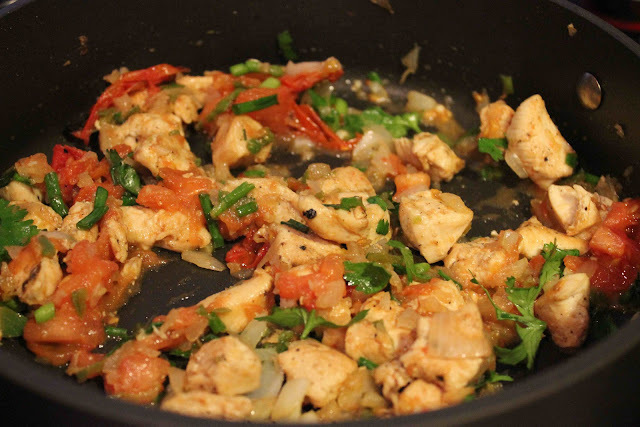 The chicken is fresh, as are the plum tomatoes, jalapeno pepper, cilantro, scallions, and onions. There is no chicken broth; instead the juices come from freshly squeezed limes and plump tomatoes. The cilantro and jalapeno pepper provide a spicy “kick,” and the chicken provides for the healthy amount of protein you need. Roll up this chicken mixture in a warmed corn tortilla, or as I mentioned before, a freshly made Central Market flour tortilla. 1. Heat a medium skillet over high heat until very hot. Add tomatoes and cook, turning occasionaly with tongs, until charred on all sides, 8 to 10 minutes. Transfer to a plate to cool slightly. Cut the tomatoes in half crosswise; squeeze to discard seeds. Remove cores and chop the remaining pulp and skin. 2. Cut chicken into 1-inch chunks; sprinkle with salt and pepper. Add 1 teaspoon oil to the pan and heat over high heat until very hot. Add the chicken and cook, stirring occasionally, until it is browned and no longer pink in the middle, 3 to 5 minutes. Transfer to a plate. 3. Reduce the heat to medium and add the remaining 1 teaspoon oil. Add onion and cook, stirring, until softened, about 2 minutes. Add garlic and jalapeno and cook, stirring, until fragrant, about 30 seconds. 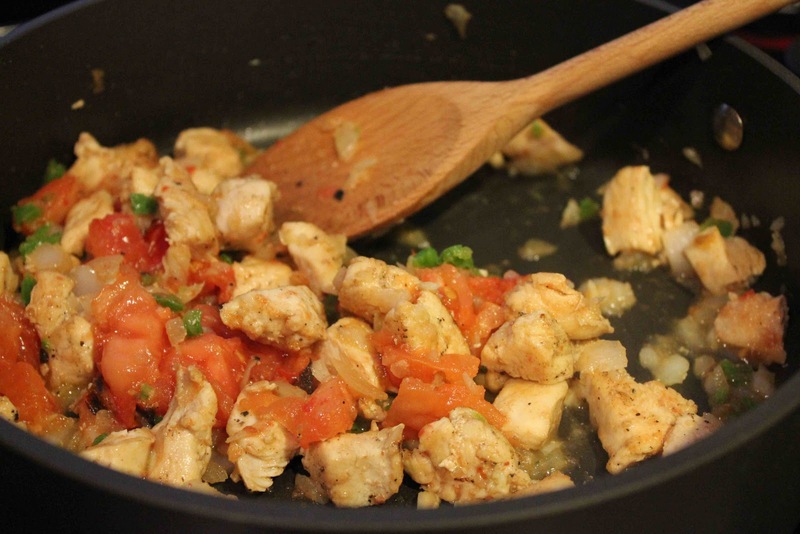 Add lime juice, the chicken and tomatoes. Cook, stirring, until heated through, 1 to 2 minutes. Stir in cilantro and scallions. 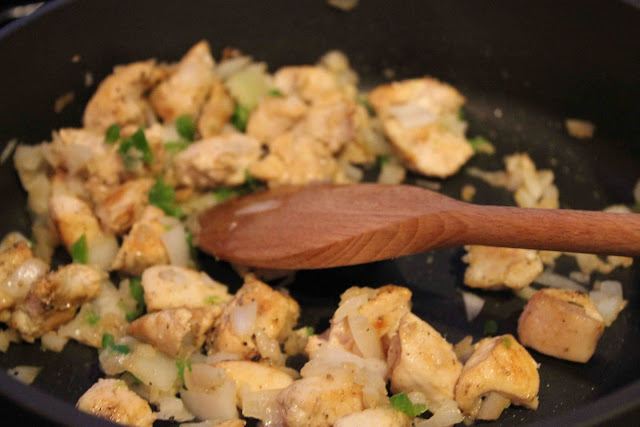 Divide the chicken mixture among tortillas. Serve with lime wedges. 297 calories; 9 g fat; 63 mg cholesterol; 27 g carbohydrate; 0 g sugar; 27 g protein; 2 g fiber; 415 mg sodium; 463 mg potassium.